Here’s a guide to growing fruit, month-by-month. Plant raspberries, which will be in plentiful supply at your local garden centre. If you have the space, choose a couple of varieties to provide a longer cropping season – autumn raspberries can carry on producing as late as November in warm winters. When planting raspberries, don’t forget they’re perennial, and this is your best chance to improve the soil. Add plenty of good compost or rotted manure to the bed, then erect stakes to support your plants. 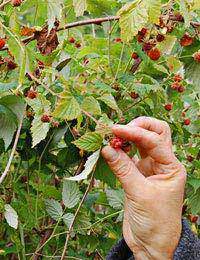 Plant the raspberries shallowly, spreading the roots and just covering with a layer of topsoil and mulch. Established autumn varieties of raspberry can now be pruned – cut them hard to the ground. It seems harsh but will reward you in the following season. Now’s the perfect time to plant your fruit trees. Expect to receive any that you have ordered, and try to plant them as soon as they arrive – trees are usually delivered with bare roots. To plant, choose a dry day if possible. Dig a hole that’s at least twice as big as the spread of your tree’s roots. Line it with grit to help improve drainage, and compost or rotted manure to give the tree plenty of nutrients. Fill it in, firming it gently, and then cover the top with a deep layer of mulch to conserve moisture. Finally water the trees generously to help their roots settle in. February is also the last month that you can prune fruit trees (except cherry and plum, which shouldn’t be pruned in the winter months at all). Time to look at your currant bushes: any established shrubs should be pruned gently this month. Prune gooseberry bushes, reducing the length of sideshoots (aim for about three buds per branch) and then feed them ready for spring growth. Look at your blueberry bushes too – pruning isn’t essential but if there is a lot of old wood at the centre and bottom of the bush, you can cut up to a quarter of it. Once you’ve done the pruning, give all of your fruit trees and bushes a feed. Use sulphate of potash and hoe it into the topsoil. We’re at the starting block now – green shoots are promising handfuls of summer fruits! So it’s time to begin a good feeding system, with high-nitrogen fertiliser for limes and lemons, blackcurrants and blackberries, magnesium-based fertiliser for grape vines, and potassium feed (tomato feed) for the strawberry plants. A good way to remember each plant’s needs is to laminate a cardboard label onto which you’ve written pruning and feeding times and types. Attach it to the shrub or tree with garden twine. You can also cover your strawberries with cloche or fleece to encourage them to fruit a little earlier. Everything is beginning to grow, which means you need to keep a careful watch. Over-zealous apples and pears can be lightly pruned to ensure they concentrate on fruiting. You can also prune plum and cherry trees, and later in the month remove protective coverings from nectarine and peach trees. Watch out for raspberry and strawberry runners – if these plants start making new seedlings between rows, there will be too much competition for light and water, so remove them straight away. If you’d like some extra strawberry plants, leave a few runners in the ground – pin them gently and let them take root. In summer, fruit trees and shrubs quickly become thirsty – you’ll need to water once a week if there’s no rain. Help them to retain water by mulching, or by pushing a tube or empty bottle into the soil, enabling you to send water directly to the roots. When pears, apples and gooseberries appear, you might want to thin them by picking some unripe fruits. This helps the remaining fruit to reach a good size, and you can usually cook the unripe pieces. It’s time to start enjoying all your hard work! This month you will be harvesting raspberries and strawberries, currants and cherries. Prepare your freezer to receive the glut by emptying it as much as you can; to freeze berries, arrange them on a tray so they don’t touch and put straight in the freezer. After a couple of hours, remove the tray and bag up the berries – this way they keep their shape. This month you can also help to ensure a healthy harvest by thinning apples and pruning gooseberry branches to a point just after the last cluster of berries. In the midst of your fruit feast, don’t forget to spare a thought for next year! It’s time to pot up your strawberry runners, which is a free way to get more plants. Without cutting the runner from the main plant, lift it and insert its roots into a small pot of compost. Watch for roots to appear beneath the pot – in a short while you will be able to sever the runner. When your summer raspberries have finished fruiting, cut back the old canes, leaving the young canes (which didn’t bear fruit) for next year. Put your strawberry runners into a cold frame and keep them well watered, allowing them to settle in for the winter. And whether you have your own bushes or not, it’s time to go blackberry picking! This hedgerow crop is a delicious partner for your home-grown apples and pears, and it’s free, so grab the kids and take a blackberry field trip. Now that many shrubs have finished their work, you can take cuttings or propagate for a bigger harvest next year. You can take hardwood cuttings of gooseberries and other currants. Lift rhubarb crowns and divide them vertically using a clean spade and a swift cutting movement; replant immediately. If you’re lucky enough to have a surplus of apples or pears, you can store them: wrap apples in newspaper and space them out in wooden crates, to store somewhere cool (a garage is ideal). Pears store best unwrapped but layered in wooden crates with plenty of space between them for ventilation. The dormant season is here, which means you can now prune your fruit trees and bushes. Apples and pears should be pruned to achieve a ‘goblet’ shape, which allows maximum light to reach the branches. Start by removing any branches that look diseased or dead, then look at the overall structure, taking out about a third of the previous summer’s growth.